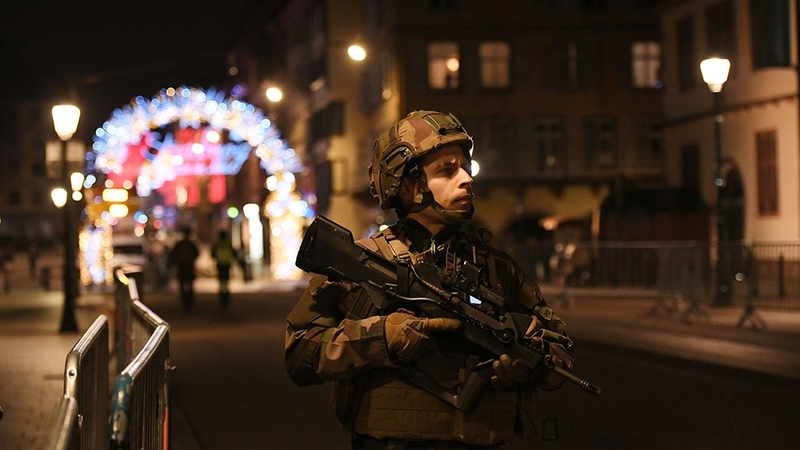 A manhunt is under way in northeastern France for a gunman who killed three people and wounded at least 13 others at a Christmas market in the French city of Strasbourg on Tuesday evening. The attacker opened fire at around 8pm local time (19:00 GMT) on one of the city’s busiest streets, sending crowds of evening shoppers fleeing for safety. Interior Minister Christophe Castaner said the gunman, who exchanged shots with security forces twice as he escaped, had evaded a police dragnet and was on the run, raising concerns of a follow-up attack. “The government has raised its security threat to the highest level and is bolstering border controls,” Castaner told a late-night news conference held in the city. Police detained five people in overnight searches around the city, Laurent Nunez, secretary of state for the Interior Ministry, said on France Inter radio. Nunez said eight of the injured are in serious condition, while the city mayor said some had head wounds. The motive for the attack is not known. The counterterrorism prosecutor opened an investigation while 350 security agents and two helicopters were hunting for the attacker. Police identified the suspect as Strasbourg-born Cherif Chekatt, 29, who was known to intelligence services as a potential security risk. “The hunt is continuing,” Nunez said on France Inter radio, adding that it’s possible that the suspect might have left France. Officials said German police have tightened border controls across the Rhine river. Nunez said the suspect has a police record and had been in jail several times, most recently at the end of 2015. German authorities said on Wednesday that the suspect served a year in prison for burglary in Germany before being expelled to France. He was sentenced to two years and three months for burglaries in the city of Mainz and in Baden-Wuerttemberg state, and jailed in 2016. According to the Tagesspiegel newspaper, the man broke into a dentist practice in Mainz, Rhineland Palatinate state, in 2012, making away with cash, stamps and gold used for tooth fillings. Four years later, he hit a pharmacy in the Lake Constance town of Engen, Baden-Wuerttemberg, where he took cash. German authorities were on the lookout for the fugitive “along the Rhine” river region, Baden-Wuerttemberg’s interior ministry spokesman said. “But at the moment we do not believe that he has crossed into the country,” he added. Police union officials told the Associated Press news agency that authorities went to the alleged attacker’s residence earlier on Tuesday to arrest him, but did not find him there. Later on Tuesday, police started to release thousands of people confined in buildings, in groups of about 100. A police helicopter is circling overhead, and entire neighbourhoods of the city – which lies on the border with Germany – remain cordoned off. Emmanuel Maurel, a member of the European Parliament, said he heard the shots. Resident Yoann Bazard told the AP by telephone that he heard “two or three shots” and screams before he went to a window and saw people running. “After that, I closed the shutters. Then, I heard more shots, closer this time,” the 27-year-old said. In 2016, a truck rammed into a crowd on Bastille Day in Nice, killing more than 80 people, while in November 2015, coordinated attacks on the Bataclan concert hall and other sites in Paris claimed about 130 lives. The Islamic State of Iraq and the Levant (ISIL, also known as ISIS) claimed responsibility for the attacks. There have also been attacks in Paris on a policeman on the Champs-Elysees avenue, the satirical weekly Charlie Hebdo and a kosher store. Next articleWhat does it take to become Trump’s chief of staff? Jared and Ivanka’s approval. Is the millennial v baby boomers battle hiding something more sinister?